What are the differences between content writing and copywriting? 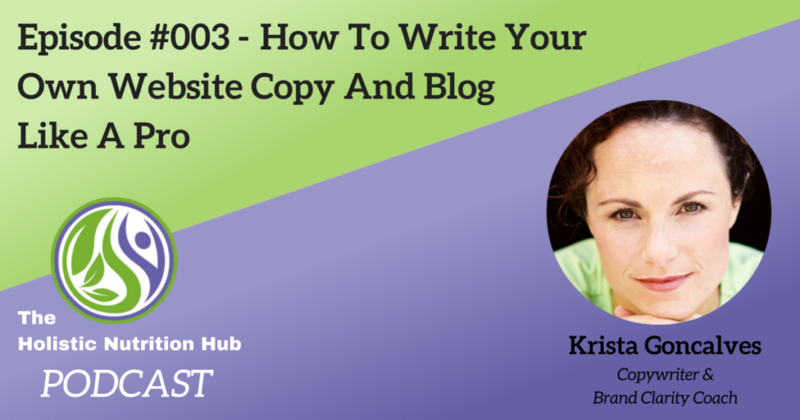 [INTERVIEW] Content Writing VS Copywriting: How can it help my business? This is a modified transcript of the podcast interview that I did with Sean Seale, co-founder of The Holistic Nutrition Hub. See link below to listen to the full 60-minute interview…we like to chat! 1. What is the difference between content writing and copywriting? I know they sound similar, but there are actually a number of major differences between the two. The one that sticks out the most in my mind is the purpose of the words that you’re writing. Essentially, it’s about the effect you want your words to have on your readers and your target audience. While it’s true that Content Writers and Copywriters both write “content”, only ONE writes it for the sole purpose of selling or at least for conversions – that is getting your prospective client or buyer to move to the next level, whether that be from downloading your free resource to a paid resource, or from your free discovery call to your paid program or service. Content writing can be generalized as creating a wide variety of content using written words. These would be things like long-form articles and blogs posts, and often includes keywords or other elements of SEO – that’s search engine optimization, which I know we’re going to likely chat about it later! Content writers also tend to focus on “evergreen content” – words that prevail and don’t have a best-before date on them. These are pieces that will be relevant long after they’re written and may only require a minimal amount of updating, if any, in order to still be considered current. Copywriting, on the other hand, is for the purpose of selling. They’ve even been dubbed a “used car salesman in print”. Now, that’s a pretty old school way to look at a copywriter, but it makes for a funny job title! Essentially they are used as advertising vehicles, typically using shorter form copy and have a more prominent focus on attention-grabbing headlines and taglines. They have a knack for using storytelling and even humour to persuade a reader to think a certain way about something – that being a product or service, effectively evoking a certain emotion in the audience. However, those being the differences, the similarity between them is that they are integral to one another – kind of like two sides of the same coin, acting as teammates. I actually consider myself both a content writer as well as a copywriter as I find the two crafts overlap so much in my work. It’s just easier to say “copywriter” as part of my title as it’s just a more well-known term. 2. Where does blogging fit in? Is it more akin to copywriting for a website or more closely related to content writing? Awesome question because I’m going to give you perhaps a surprising answer…it’s both! Blogging would first and foremost be considered content writing, for obvious reasons, but the way in which there’s crossover is that your blog posts if writing them for your business, should always have a CTA – or a call to action. And that, my friends, is copywriting territory because you’re literally guiding your reader into action. Again, you’re intending for them to “feel” a certain way – and they hopefully feel inclined to take action! 3. Why is it important to have a blog? What is its purpose? I am of the camp that you most definitely need a blog for your business – whether it’s offline, online or a combination of both. The number one reason for doing this is that you want to have a website that provides unique and relevant content that gives visitors a reason to visit your site first. The best way to do that is to have a blog, and do it regularly and consistently. Multi-purpose content – and by this, I mean that you can (and should) repurpose your blog posts in whole or in part. A blog post should never just be a one-off piece of content as it can be repurposed many times over into things like snippets for your promotional copy in social media posts, expanding a post or stacking several blog posts together into an e-book or lead magnet. 4. For those who have never blogged before, what’s the best way to start? What topics to choose? If you’re just getting started, or you have yet to start your blog for your business, here’s my top piece of advice before you do anything else…make sure you have identified specifically WHO your audience is and WHAT they need from you. 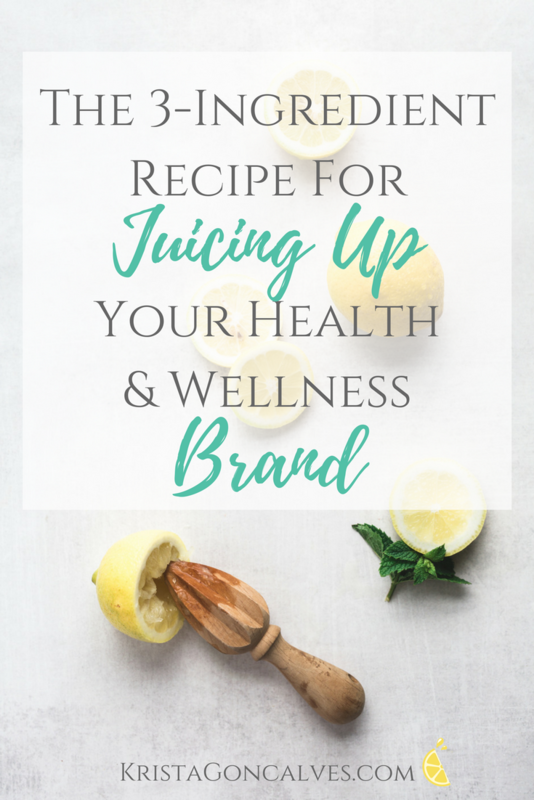 Please do not do what I did when I first started blogging — randomly writing about whatever health or wellness topic came into my brain. Sure it had something to do with natural health & nutrition, as I was a practicing Holistic Nutritionist at the time, but it was still completely random and virtually no one was reading my blog! It was only when I identified my target audience as “hormonally challenged women who were 35-50 years of age and were struggling with the challenges of raising school-aged children while trying to balance their hormones” that my content really started to get noticed. So, once you’ve identified that – begin creating content with your target audience’s pain points in mind, lots of it. There are literally thousands of different blogging resources so to filter out some of the noise and get right down to basics and priorities, those are the two key things that I would suggest. Your wish is granted my sweet friend. Here’s the podcast audio link — have a listen! 5. How often should one publish on their blog? There’s honestly no magic number for how much or how often you should publish – and in all truth, it should always be quality over quantity. When I first started blogging I aimed for once or twice per week, but now I publish posts only twice per month — on the 1st and 15th of the month. That’s what keeps my website current, keeps me on the search engine’s radar and what I’m comfortable with at this time – as in what doesn’t stress me out having to keep up with! I would just choose a publishing schedule that makes sense to you, and that you can keep up with consistently. Your readers will come to expect a standard and schedule of content from you, so again, just be consistent. 6. What is the first thing that one should find and read on someone’s website? This would be the “About Me” page. The reason for this is that your reader is actually looking for yes, what you’re all about, and why you do what you do, but they’re also looking for how you’re going to help them – what do they get out of the whole transaction? The key to writing a compelling About Me page is to actually make it about them! That’s actually why when I’m hired to write this particular page of copy for clients that I encourage them to call it “Start Here” instead. A menu tab or page with that heading on it is just so compelling to click on, isn’t it? It’s like having a CTA right in your menu. 7. How to overcome the fear of writing one’s own copy? It might sound funny to some of you out there that there could actually be fear around writing, and I probably was one of those people who thought it was odd at some point because I’ve personally always enjoyed writing and have never been squeamish about putting it out there for various purposes over the years in my businesses. As much as I love writing for other people, I also don’t want them to forever be dependent on me (or another writer), so I’m always sharing tips to empower them to take the bull by the horns and at least dabble in their own writing. Working through comparisonitis or imposter syndrome; this is probably the major driver of fear as it relates to writing – thinking you’re not a good enough writer or what you have to say isn’t interesting or that you’re not knowledgeable enough or that your work will be rejected or that all of the topics you come up with have all been written about a hundred times over so why even try? For this, you must give yourself permission to write. You are knowledgeable enough, your backstory is interesting, and what you have to say is important. Just be your authentic, genuine self. If your words don’t resonate with certain people, then those aren’t your people. I’m often told that I write like I speak, so when I’m interacting with people in other ways than through my writing, then they know they’ve come across the real deal. Either you get me, and what I’ve got to share with you, or you don’t. And I’m totally ok with that. In fact, I would prefer if I repelled some people because they wouldn’t have been receptive to joining my community and what we’re all about anyway. Accepting imperfection is a big one! No one piece of content will ever be perfect, just get started, and get finished, and get it out there. I used to have a terrible habit in my writing process that I called “tinkering”. I would hang on to a blog post, for example, for days, sometimes weeks – going back and tinkering with it, but never feeling totally satisfied with it. Hitting the Publish button was terrifying because it never felt quite right and worthy of being out on the interwebs. Then I just got burnt out by this habit and decided that it didn’t serve me, didn’t serve my audience and certainly wasn’t going to further my career. So I just let it all go – let go of the intense need for perfectionism. Now, my blog posts are written and published in a fraction of the time! 8. What is a call to action (CTA) and where does it belong in website copywriting? As I talked about earlier, a call-to-action or CTA is when you direct or instruct your reader or prospect to do something – to take action. It’s basically the “ask” and it really is the essential piece of copywriting. Providing value, sometimes known as a value proposition; I.e. tell the reader exactly what’s in it for them and what they’ll get in exchange for sharing their personal information, clicking, subscribing, or joining. 9. Any useful tools you recommend to check spelling, grammar, etc? I love Grammarly – it catches stuff that I’ve glazed right over in my copy. I think everyone should use it! I draft all of my content, whether for myself or for a client in Google docs, which actually doesn’t integrate with Grammarly. So I do an initial spell check and proofread of my document, ensuring that it’s laid out and formatted that way I like, then clip it out and paste into my website platform – which is WordPress. Then Grammarly is engaged in my WordPress Editor, and I do another thorough proofing of the post. I often upload content to my client’s websites so I follow the exact same process in this case. I also can’t stress enough how important proofreading is…so if you don’t feel confident catching your own errors, even after using a program like Grammarly, be sure to get some fresh eyes on your work. There’s nothing worse than catching a bunch of spelling mistakes in what would otherwise be a great piece of content! 10. What is SEO and how does it fit into copywriting? 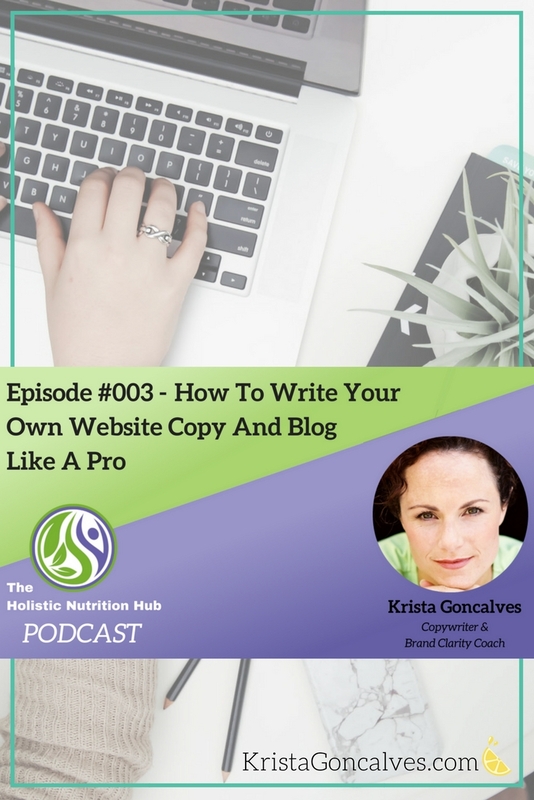 It can be a bit tricky, especially when you first get started writing for yourself because it takes a bit of practice to write around a certain set of keywords that you’re trying to get found within organic searches. But copywriting with an SEO focus is all about creating useful, compelling and valuable content that targets specific keywords so that other people will gladly promote on social media platforms. This increases the authority and relevance of your content and improves its ranking in Google for those selected keywords. So when you highly recommend something, for example, Google sees it as relevant and you will achieve better SEO content results. SEO copywriting, at its basic level, helps you target your customers and solve their specific problems with well-crafted content. 11. Any tips for those who want to write their own copy? First, I truly believe that EVERYONE CAN WRITE!! Whether everyone wants to write, well, that’s a different story. My top tip is to just get started. Ditch the perfection, brainstorm all the ideas you possibly can, make a content creation & publishing schedule – and just get started. I know that seems overly simplified, but that’s what it really comes down to. If you really are starting at the very beginning, and don’t have any content or copywriting under your belt, get some of your own blog content going and start by crafting your backstory. On the other hand, if you truly find that writing your own copy is just not your forte, or it causes you undue stress, then consider setting aside a part of your business budget to outsource it. Sean asked what books I would recommend to the audience – one that I’ve read and loved recently? Through my fumbling, thinking we were still talking about writing (you can see where my #wordnerd thoughts lead me! ), I shared The Perfect Day Formula, by Craig Ballantyne.